Picked up a couple imx-pro's for the crankers (903 and 864 deep flex). Zillion will do traps this weekend, but wont stay there Thinking about some green knobs. KP Duty wrote: Picked up a couple imx-pro's for the crankers (903 and 864 deep flex). Zillion will do traps this weekend, but wont stay there Thinking about some green knobs. What are you doing with that pair of pink SLP knobs? Got any hot pinks? Stunning combo izeil I've been wanting to do a kaleido/revo combo for some time. So sweet! you rarely see that combo around. I have a couple of steez tw's and those slp tats all have short handles and those knobs will adorn the handles I havent ordered yet. I've been sidetracked with other projects. I too want a set of hot pink knobs. Are they discontinued? U kicked myself for not ordering the gold metallic knobs. 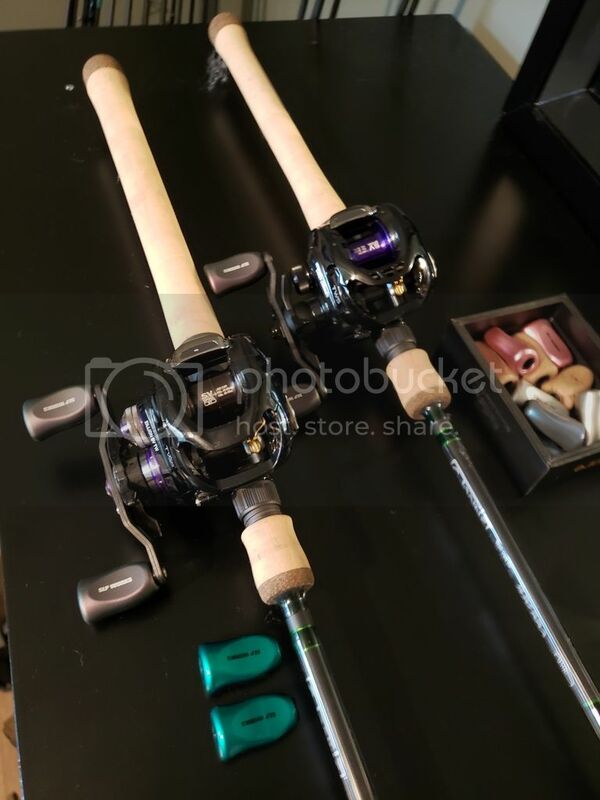 I just got two of those rods as well as it was finally time to somewhat retire my old Deep Flex (cinnamon colored) rods. I haven't used them yet, but i think i will like them even better if that is possible. They feel like they have a just a hair more back-bone with that same great tip. I find them perfect for balsa baits. Tell me about that Tatula? Is that a factory spool? The tats have stock spools. These are still available at a shop or two for 28,500 yen. The problem is the 80mm handle. The slp zillions came with 90's, but not so with the tat cranker. The paint on these seems to be very good. Had a severe storm come through tulsa last year, and my combos all hit the ground. Both my new steez's have a scratch, but the scuffs on my slp's wiped off with some quick detailer. Yes! KP Duty wrote: The tats have stock spools. These are still available at a shop or two for 28,500 yen. The problem is the 80mm handle. The slp zillions came with 90's, but not so with the tat cranker. The paint on these seems to be very good. Had a severe storm come through tulsa last year, and my combos all hit the ground. Both my new steez's have a scratch, but the scuffs on my slp's wiped off with some quick detailer. Yes! I missed the first boat on the PG spools and now mine has arrived so I have updated this reel along with the knobs. Also inside are jjbassnforfun's 7.1 gears that have not only been performing very well for me, but also have brought a stroke of good luck with them. Vacation starts soon and it looks like FL will have prime WX for the holidays. Nice. Is that a pink personal order? LowRange wrote: Nice. Is that a pink personal order? Thanks, yeah it's a PO or at least the most of the frame still is. I cannibalized the purple drive shaft cap (if that is what it's called) off of a td-ito. Engine handle, tacker knobs, hedgehog parts, and zpi spool that i haven't got a chance to use yet.